I’ve had a round of polenta in the fridge for the longest time, and I wanted to make something other than Polenta Lasagna (not yet posted) with it. I’m a real fan for lasagna, but I was looking to do something a little different… and of course still extra tasty. I also had some kale that was looking pretty sad and wilted. I normally throw it in my smoothies, but I was in a creative mood. For those that aren’t familiar with polenta, it’s really just boiled corn meal. You can make it yourself, or if you’re looking for a quick meal, buy it by the tube in your grocery store, typically in the baking aisle (think flour, sugar, corn meal, and BAM polenta). I normally find the Food Merchants brand, which comes in different varieties (sun-dried tomato and basil, garlic, cilantro and chili, etc.) Polenta is a fairly versatile ingredient. You can serve it as a cornmeal “mush”, which is the actual translation of the word in Italian, with butter and cheese (or Earth Balance and Daiya!). You can also slice it, then sauté, bake, grill, or fry the slices and then incorporate them into a variety of dishes. Low and behold, I plugged in the search terms “polenta”, “kale”, and “vegan”, and ran across C’est La Vegan‘s most amazing blog. I’ve checked out a few recipes from her catalog, and they’re pretty darn good. Her Polenta with Balsamic Kale & White Beans sounded promising, but I realized halfway into the recipe that I didn’t have any white beans! Doh! Since I was feeling creative (and because I really had no other choice) I pulled out a dependable can of Goya black beans and winged it. I didn’t realize I had “cheap” balsamic vinegar (I thought they are all the same? ), so I did as the recipe suggests, and that is to reduce the vinegar in a saucepan until it’s nice and syrupy. I’d never done this before and I learned not to inhale while leaning over the pan… It burns your nostrils! No worries though. Lesson learned. You can add more red pepper flakes if you want it to be a little more spicy. I just added a “pinch”, and you can barely taste any heat. If you have spice-sensitive kids, stick to the recipe or eliminate the red pepper all together. But if you’re living on the edge, feel free to dump more in. As the author notes in her blog, it takes a little bit of time for the polenta to turn brown in the pan. If you get the heat/oil ratio down though, it might go quicker. I wasn’t using much oil, and at one point my polenta went from yellow to black and smoky in about 2 seconds. (When the smoke detector goes off, “Dinner is ready!”) If I used more oil, it may have browned a little more gently. Make sure you really rinse the beans. Pour the can into a strainer and move them around until the water runs clean. This will definitely be a go-to recipe in the future for me. It’s cheap and easy. My omnivore husband loves it. It’s filling, delicious, and extra healthy (kale is a definite power-green). What’s not to love? 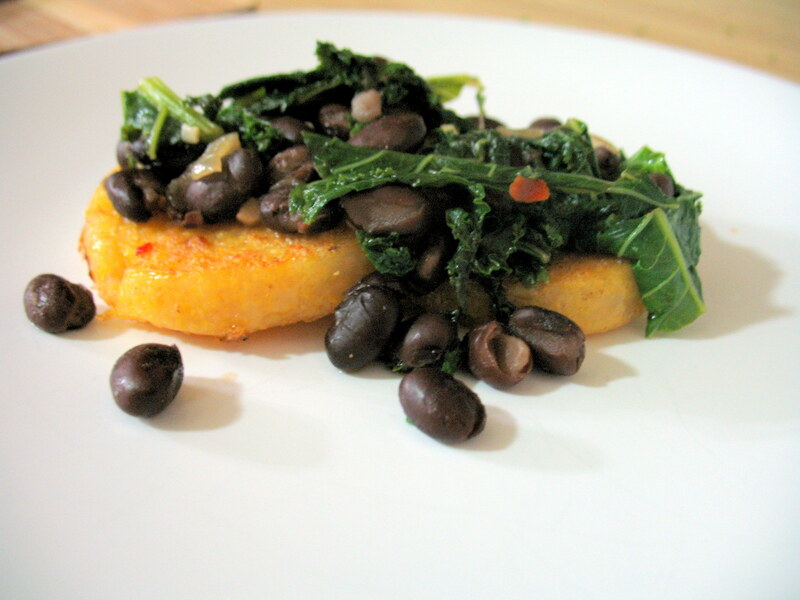 Polenta with Kale and Black Beans (adapted from Polenta with Balsamic Kale & White Beans) Thank you C’est La Vegan! Slice the polenta into 1/2-inch thick rounds. Heat a large non-stick skillet over medium-high heat and brown the polenta on each side. (I use a spray olive oil for this, but you can use regular olive oil, or no oil at all.) Set aside. While the polenta is cooking, heat a large pot over medium to medium-high heat and add the olive oil. Add the onion and saute until it’s softened, about five minutes or so. Add the garlic and red pepper flakes and saute for about a minute more, or until fragrant. Add the kale with the water still clinging to the leaves, give it a stir, and cover the pot. Cook for a couple minutes to start wilting the kale, then add the vegetable broth, cover and stir again. Cook the kale until it’s tender, about ten minutes or so depending on how hot your pot is. Once the kale is almost tender, stir in the black beans and cook with the lid off, just until they’re heated through. Add the balsamic vinegar and salt and pepper to taste. To plate, place a couple polenta rounds on the plate and top with the kale mixture and a drizzle of balsamic vinegar. ← Announcing my February Health Month goals!